Comments by both U.S. Ambassador to Russia John Tefft and U.S. President Barack Obama indicate that the U.S. has little motivation to lift sanctions against Russia. 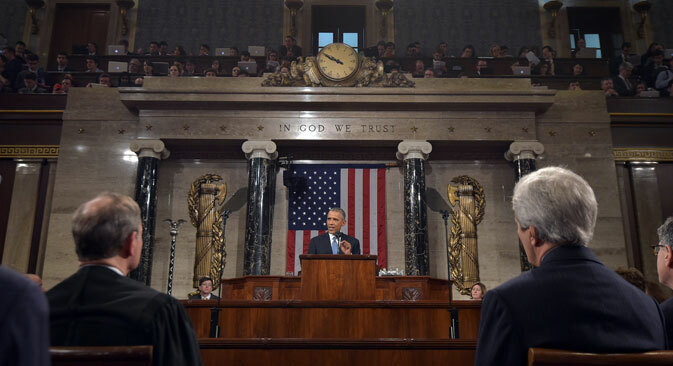 On Jan. 20, the same day U.S. President Barack Obama delivered his annual State of the Union address, U.S. Ambassador to Russia John Tefft stood before members of the American Chamber of Commerce in Moscow to discuss the state of U.S. sanctions against Russia and their effect on American economic interests in the country. Tefft said that the sanctions imposed by the U.S. and the EU over these events were not the major cause of Russia’s economic troubles, noting that Russia’s economy was slowing even before sanctions were imposed and that oil prices along with the Russian governments “self-inflicted counter-sanctions” were all more significant in their effect on the current economic situation. However, Tefft acknowledged that American business interests in Russia were affected by the economic downturn and the fall in the value of the ruble. “I know the dramatic drop in the value of the ruble inevitably affected your supply chain and bottom lines. And the sharp increase in interest rates and continued decrease in credit will further suppress investment and growth,” Tefft said, according to a transcript of the speech posted on the website of the U.S. Embassy in Moscow. But the overall message from Tefft was that the U.S. government’s desire to stand by its principles in regards to Ukraine takes precedence over maintaining the competitiveness of American firms operating in Russia. “There continues to be strong bipartisan consensus in Washington that we must respond resolutely to Russia’s illegal and destabilizing actions in Ukraine, even if that stance is costly to some of our other interests,” Tefft said. The overall lack of importance Russia plays in the American economy was felt in Obama’s State of the Union speech. In a speech lasting almost exactly an hour and dominated by words including “jobs,” “economy” and “work,” according to political analyst Domenico Montanaro, Obama mentioned Russia only once, in a brief 75-word section that echoed Tefft’s comments about the U.S. standing up for its ideals. “We're upholding the principle that bigger nations can't bully the small – by opposing Russian aggression, supporting Ukraine's democracy, and reassuring our NATO allies. Last year, as we were doing the hard work of imposing sanctions along with our allies, some suggested that Mr. Putin's aggression was a masterful display of strategy and strength. Well, today, it is America that stands strong and united with our allies, while Russia is isolated, with its economy in tatters,” Obama said, before moving on to a discussion of the new U.S. policy over Cuba. Despite the brevity of the comment, the Russian political establishment reacted strongly to Obama’s words. Nearly every major Russian media outlet covered the speech, and several Russian politicians took to Twitter to express their views. Alexey Pushkov, head of the Russian State Duma Committee for International Affairs, wrote on his Twitter feed that Obama “Forgot about the 4,800 civilians Kiev killed in eastern Ukraine. ISIL killed fewer,” according to Gazeta.ru. For comparison, in comments to a PBS correspondent after the speech, U.S. House International Affairs Committee Chairperson Ileana Ros-Lehtinen (R-Florida) ignored Russia completely, focusing instead on the Cuba policy.